Home Accounting Banking Commerce Knowledge Finance Get Information ICAI Indian Accounting KNOW YOUR BANKNOTES. 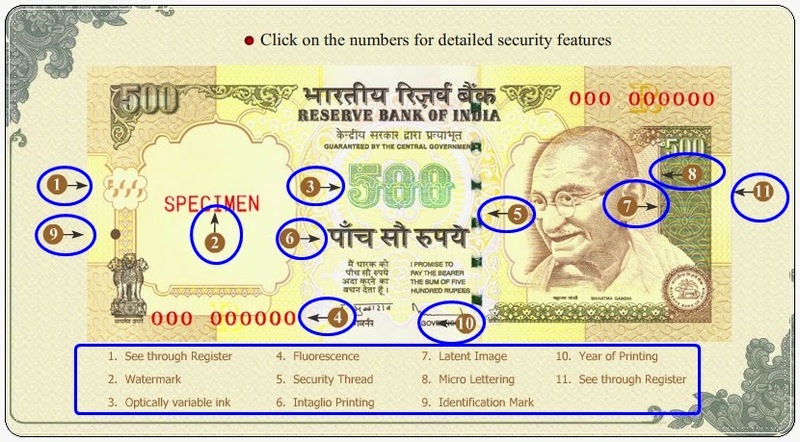 Use thease 11 Simple stemps to find out INR.500 fake notes. KNOW YOUR BANKNOTES. Use thease 11 Simple stemps to find out INR.500 fake notes. 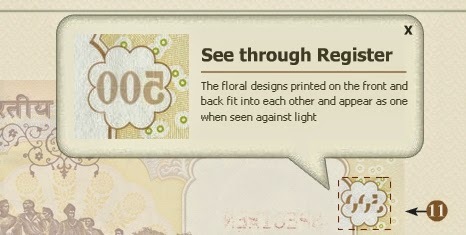 The floral designs printed on the front and reverse in the middle of the vertical band next to the watermark window has the denominational number '500'. Both the printed portions have an accurate back to back registration so that the numeral appears as one when seen against light. 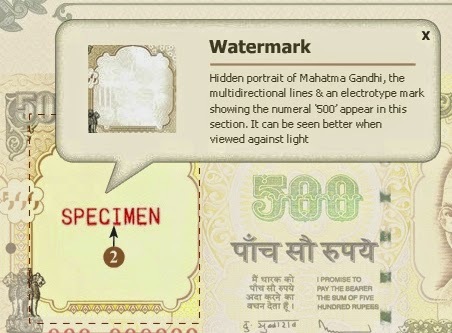 Hidden portait of Mahatma Gandi, the multidirectional lines & an electrotype mark showing the number '500' appear in this section. It can be seen better when viewed against light. The colour of the numberal '500' appears green when the banknotes is held flat, but would change to blue when tilted to an angle. 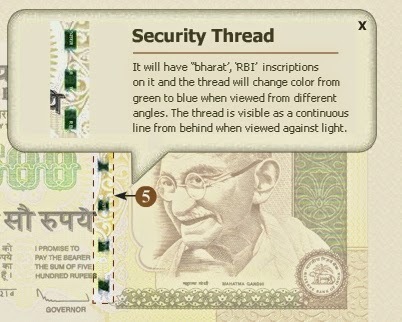 The banknote series, Number panel, Security thread and few particles (scattered in a a note) will glow when exposed to ultraviolet light. It will have "bharat', 'RBI' inscriptions on it and the thread will change color from green to blue when viewed from different angles. The thread is visible as a continuous line from behind when viewed against light. 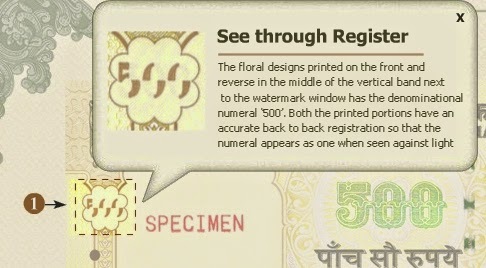 The portrait of Mahatma Gandhi, the Reserve Bank seal and 'Paanch sau rupiye' are printed in intaglio (raised ink), which can be felt by touch. 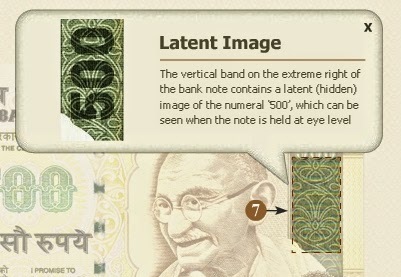 The vertical band on the extreme right of the bank note contains a latent (hidden) image of the numeral '500', which can be seen when the note is held at eye level. 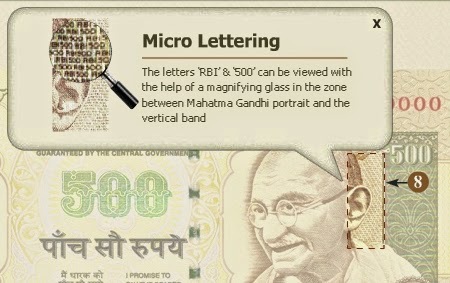 The letters 'RBI' & '500' can be viewed with the help of a magnifying glass in the zone between Mahatma Gandhi portrait and the vertical band. 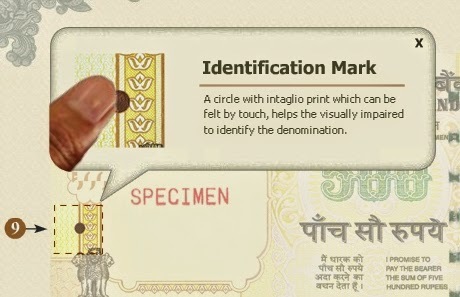 A circle with intaglio print which can be felt by touch, helps the visually impaired to identify the denomination. 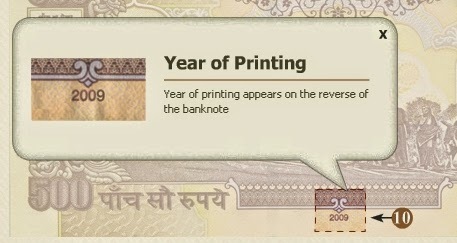 Year of printing appears on the reverse of the banknote. The floral designs printed on the front and back fit into each other and appear as one when seen against light.